Lake udziro is small alpine lake (literally without bottom) on the altitude of 2800m, situated near Shovi resort, Racha on the slope of Mt.Katitsvera (3300). Route crosses 3068m pass (moderate difficulty for experienced hikers). 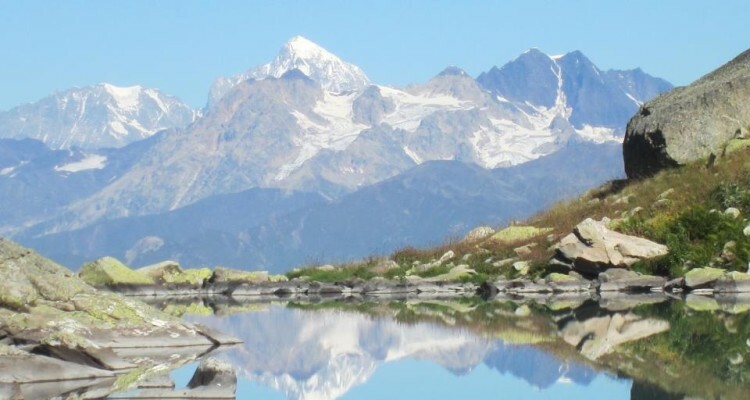 It makes perfect 2-day summer hike in nice weather with camping at the lake from which there are incomparable panoramic views to the Caucasus mountain range. Before describing this one of the impressive hiking route, I will tell you few words about the base place for this hike Shovi resort and the region Racha. The resort is located in Georgia’s exotic Racha region, on the shore of river Chanchakhi. 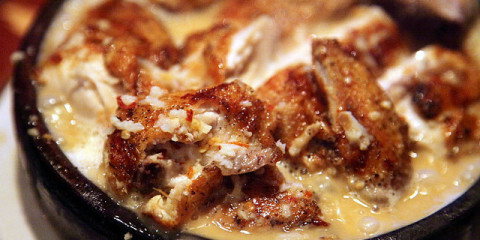 The region Racha is not described in most travel guides. 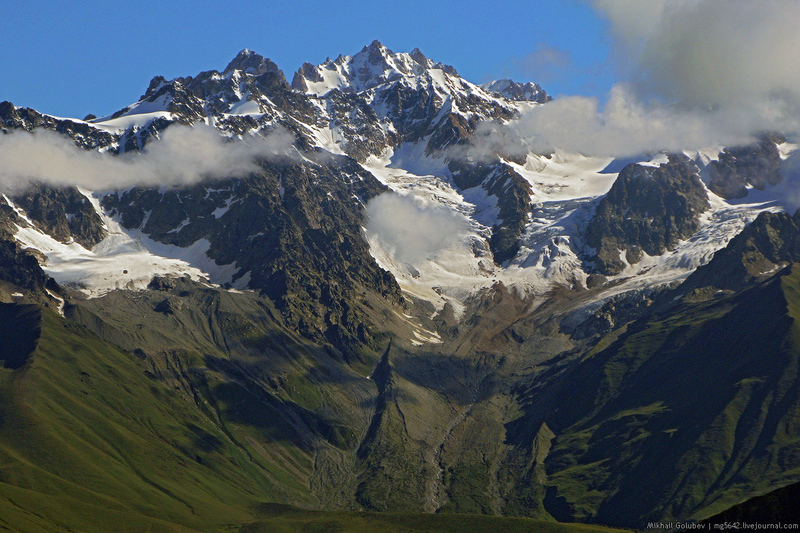 It has less to see in comparison to Svaneti but it has undoubtedly fantastic nature. Resort Shovi, established in 1926, is located 350km west from Tbilisi and 130km from Kutaisi. It’s famous for its unique 16 types of mineral waters. 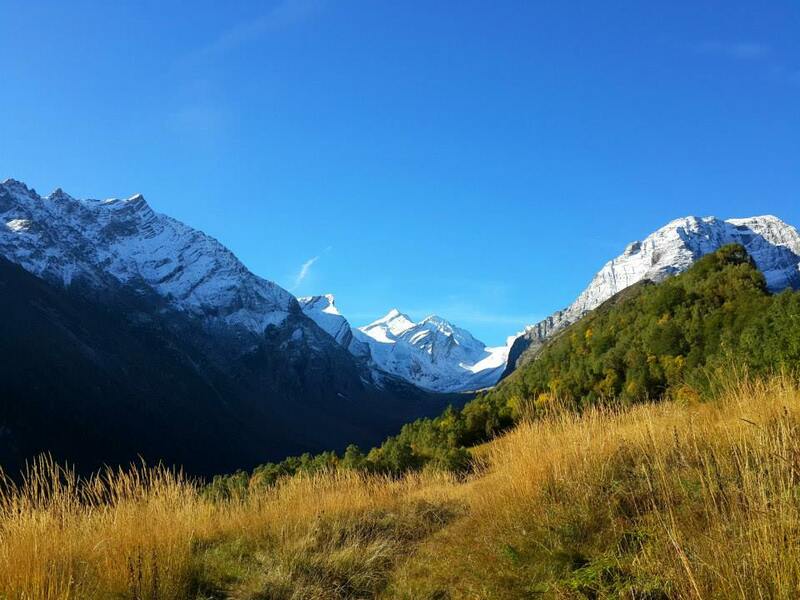 Shovi is suited on 1650 meters from Sea level and belongs to semi-alpine resorts. 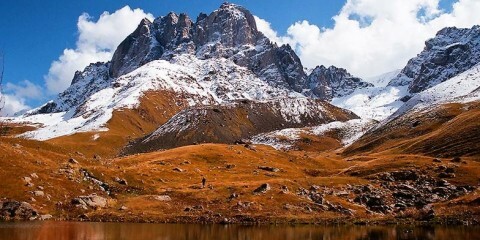 On the north the resort is surrounded by high mountains of the Caucasus with an average height of 4000 meters. 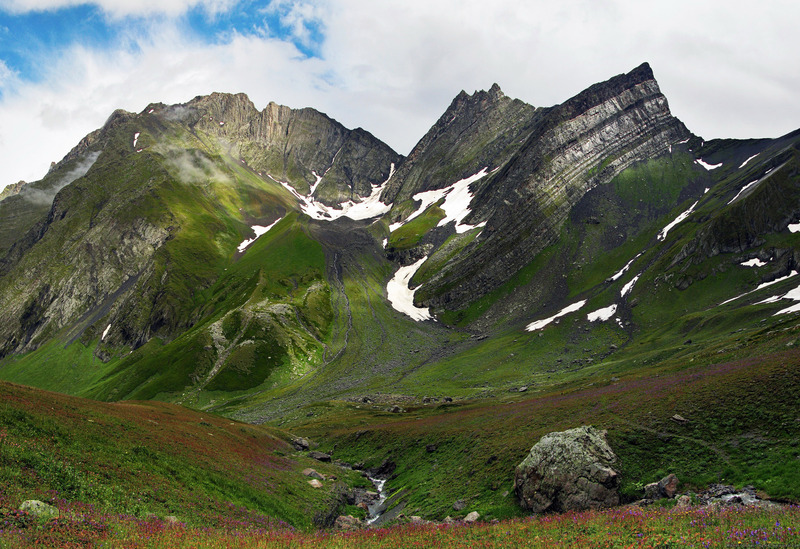 On the south, west and east it is bordered by Shoda-Kedela mountain range of the Greater Caucasus mountains with a heigh of 3,000-3600m. The highest peak is Shoda 3609 and another peak on slopes of which our destination Udziro lake is located is Katitsvera (3300). Shovi is fully protected from northern winds thanks to this ranges. There are many hotels to stay in Shovi, among those, for quiet rest in a wonderful nature, you can visit 4-star hotel sunset Shovi. To get to Shovi you drive or take mini bus to Shovi/Oni from Didube (8AM around 25GEL). You need to stay in Shovi in a hotel or camp there. (If you first stop in Oni, which used to be one of the oldest settlement of Georgian Jews with old sinagogue, you can stay at Hotel Gallery which is popular among tourists). From Shovi you need to follow gps track posted below or get a local guide (total 100 gel for 2 days). You need to bring your camping gear with you. It’s possible to do this trip in one day too if you are very experienced hiker and start as early as 5AM in the morning, but I certainly recommend 2-day trip with camping at the lake if it’s not late September or early June when its still lots of snow around. The best season is sunny days of July-August but it’s possible to do this trip even in September and June with caution. You will walk up beautiful pine forest from Shovi, then you will reach alpine valley and after that very tiring and sometimes very steep ascent starts. After that you reach the pass with beautiful views. 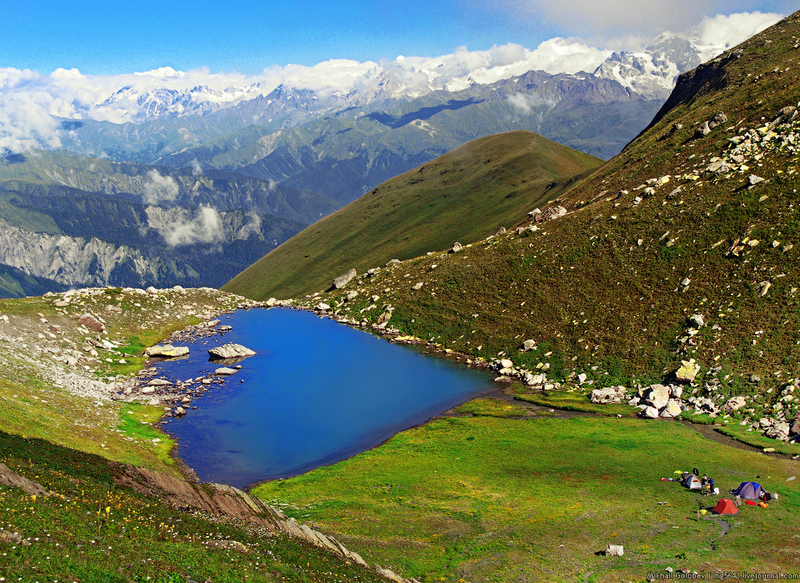 It takes 8 hours to reach the pass and to descend to the lake (1700-1800 in vertical up and 350m down in around 12km). There is spring and small field in front of the lake so it is must to camp there. 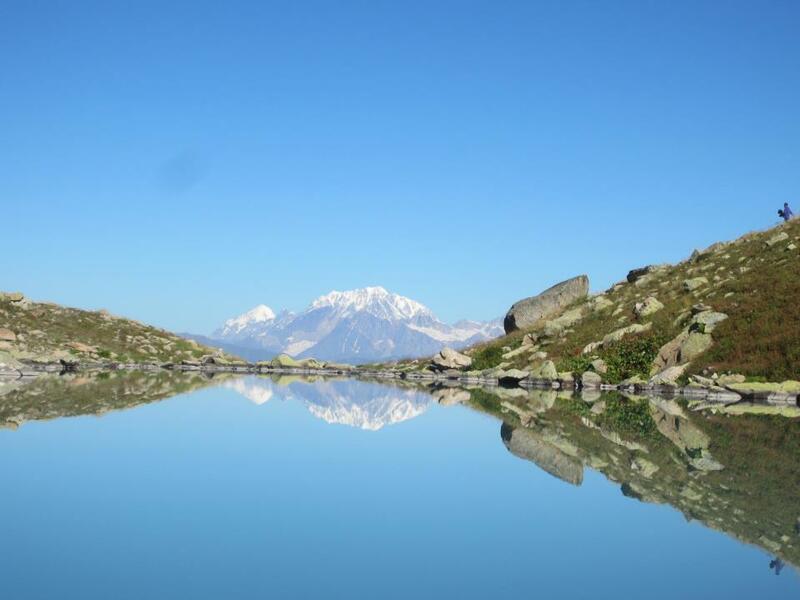 When you wake up in the morning you will have wonderful view: Caucasus great range summits will be reflected in the water just like this: Tetnuldi (4852), Shkhara (5200) and Ushba (4700) and many other summits of greater Caucasus range. Then you can descend to another way to Glola village without crossing the pass again but it’s easier to find your way back by crossing the ridge. You can use the gps tracks here: one for Shovi-Udziro route and another for Udziro-Glola route. You can also visit Russian tourists blog translated into Georgian about this trip. from Saturday till Friday and we’ll arrive to Kutaisi at 6 am, andrent a jeep. on Friday evening would like to get back to Kutaisi. What do you think, is it possible to make it? Bcse Im just affraid that the roads, and the circumstances are a bit different there. so do you hire that jeep and drive yourself? Roads for Tusheti are not easy. You need 3 days for Tusheti and you will need to drive around 4-5pm latest to cross the pass on a right time. On Sunday evening you will arrive in Tbilisi not in Gergeti. Road from Tusheti will take some money and energy. 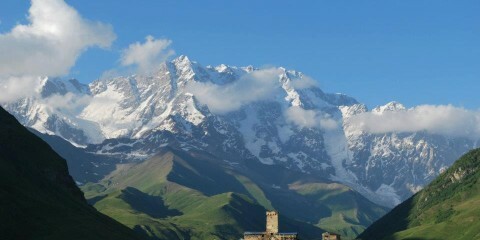 you can do 3 or 2 or even 1 day trip to Kazbegi as you wish its possible from Tbilisi. 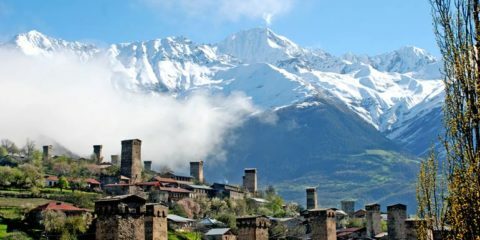 Svaneti do you mean Mestia? Ushguli is also Svaneti; From Tbilisi to Ushguli you need to drive the whole day but its possible. Hope you will have nice weather that evening or morning in Ushguli; I usually give more than 2 days to Svaneti, like 4; but its possible to do in this time too. Have a great trip, and if you have questions I will be happy to reply. We tried to make this trip in two days using only your gps track, and decided to turn back after having spent a few hours on the pass looking for the route in sporadic visibility. We saw the lake from the top of the ridge, but it was not at all obvious how to descent there without a more detailed map and enough time. I would say the trip requires planning for three days and great caution, given that the trail is unmarked (we saw no cairns after the pass, and only a few before) , the approach path ends half-way through the valley, and the weather >3000 m can be very changeable even in August. Hi Alex, Unfortunately you were not lucky with the weather. Its always good to check forecast before. Generally its great to have a local guide as this track is not easy and surely unmarked. Regarding number of days, some crazy people even do in 1 day depends, for me I would say 2 days in a good weather is enough, but it would be more relaxing to allow 1 more day. From the ridge to descend to the lakes took 40-50 minutes, but with caution, some people even did it sitting at times. This looks like a truly wonderful hike– unfortunately my boyfriend doesn’t camp! Would you say it’s worth walking as far as we can on the way to the lake, then heading back? Or are there better day hikes in the area? Thank you very much for any insights. We are so excited to visit Georgia in early September. Hi, If you are very fast hiker and you hike starting from 5am and are not afraid to hike down in the dark (with help of local guide of course), then it may be worth to do a dayhike. Buba glacier dayhike can be an idea in Shovi. and this is another great dayhike. both from Chiora/patara Ghebi area near here.